LA based Irish actor Kevin J. Ryan (Copper, Raw, Sons of Liberty) plays King Arthur in Tile Films “Sacred Sites – King Arthur” directed by Stephen Rooke. Season Two of 'Sacred Sites', Tile Films' epic 4K UHD docu-drama series to air on the Smithsonian Channel in North America on Monday 13th August at 8PM ET/PT. Reaching over 30 million households in the U.S. and Canada, 'Sacred Sites' Season Two will be broadcast on the Smithsonian Channel in August and September. Following on from 'Sacred Sites' Season One, broadcast in 2016, these new episodes offer unique insights into some of the world's most hallowed shrines, temples and monuments. From the supposed tomb of King Arthur to ancient Egyptian temples once controlled by female priests, from the timeworn pilgrimage route of Santiago de Compostela to the haunting Stone Age temples of Malta, and from the spectacular and evocative cities of the Maya to the ancient temples that fascinated the Nazis, the world's religious sites are home to alluring secrets and mysteries. Over six brand new and enthralling episodes, 'Sacred Sites' explores enigmatic religious sites around the world. Featuring advanced scientific discoveries and archaeological research, the new episodes will bring viewers to sanctified and historical locations stretching from Europe to North Africa. Filmed on location in twelve countries, the series was directed by Tile Films' Managing Director Stephen Rooke (Sacred Sites: Season 1, Aerial Ireland, Saving the Titanic, Waterways) and Ruán Magan (Wrecking the Rising, The Men Who Built America, Cé a Chónaigh i mo Theachsa?). Tile Films' Head of Development, David Ryan (Sacred Sites: Season 1, After Braveheart, Cromwell in Ireland) was the developer and Creative Producer of the series and Writer of three episodes. The series producers were Stephen Rooke and Laura Danaher (Sacred Sites: Season 1, Death or Liberty). The Season Two opening episode, 'Sacred Sites: King Arthur' explores the myth of one of the most famous and legendary monarchs of all time. Legend says that King Arthur will return again one day to rule Britain, though many experts believe he was simply a mythical figure. Yet in the last few years, new evidence from ancient sites across England and Wales suggests that this powerful legend is rooted in fact. This episode seeks to answer the question: was this storied King a legend, or real? Subsequent episodes of 'Sacred Sites' explore a further five incredible stories based on new research on ancient monuments and temples. 'Sacred Sites: The Maya' studies the Mayan belief in three levels of existence and how their sites were built in harmony with a fascinating concept - the centre of the world. 'Sacred Sites: The Camino' investigates the Christian pilgrimage route to Spain's Santiago de Compostela and the extraordinary new research into its possible origins in paganism and heresy. 'Sacred Sites: Malta' looks at the collapse of the ancient temple civilization on Malta around 2300 BC and the shocking causes of this apocalypse. 'Sacred Sites: Egyptian Priestesses' reveals the new evidence of a hidden power structure in ancient Egypt - one controlled by women. 'Sacred Sites: Nazi Myths' explores how the Nazi party attempted to uncover the sacred sites of a pure Aryan religion to fuel their warped ideology. Founded by Stephen Rooke in 1989, Tile Films has had a long-standing and extremely fruitful relationship with the Smithsonian Channel, and hopes to continue this partnership in the years to come. As with Season One, the support of Section 481, Ireland's Film Corporation Tax Credit, proved integral to funding and producing 'Sacred Sites' Season 2, which employed over 150 crew, cast and production personnel. Directors of Photography for the series were Mick O'Rourke and Colm Hogan. The Sound Recordists were Michael Cassidy and John Brennan, while sound mixing was conducted by Killian Fitzgerald of Avatar Audio Post Production. The series was edited by Jim Dalton, Keith Walsh and Janice Toomey. Post production was provided by Outer Limits with Eugene McCrystal as colorist, Rory Gavin as online editor, Andy Clarke and Kevin O'Brien in charge of VFX. Music composers were Giles Packham, Ray Harman and Damien Walsh. The production designer was Lynne Williams of Irish Arms and Maeve Kenny and Maggie Fagan were production managers. The drama re-enactments were filmed in Ireland and Morocco. 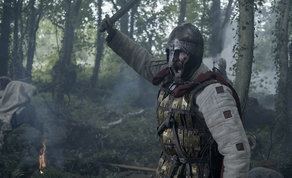 Irish/Americian actor Kevin J. Ryan as King Arthur in the first episode of 'Sacred Sites'. 'Sacred Sites' Season 2 is produced by Tile Films for the Smithsonian Channel. Stephen Rooke is executive producer for Tile Films, while David Royle and Tim Evans are executive producers for Smithsonian Channel.